Aside from all those "life is precious" thoughts, I've also been thinking a lot about my crafting goals for 2018. I recognize that I'm making somewhat of a big deal about my goals this year simply because I wasn't able to make any last year since I had no idea how long my recovery from Carpal Tunnel release surgery was going to be and I was uncertain about whether not if I would even be able to knit (due to the other hand). I felt like I was all over the place crafting-wise since I was unsure about my hands and once I was able to knit again I was a bit hesitant to take anything on, just in case. This new year though, is a different story. I'm feeling quite positive and even started the new year knitting! I'm excited that I'm able to hold off on having surgery on my right hand (for now), as long as I keep up with regular breaks (no more marathoning for me! ), stretching, and taking proper time out to enjoy other maker activities (like baking!!). Obviously, I'm not going to go crazy and knit up a storm...even though I really want to cast on allllll the knits. I still want to take it easy on myself so I've made only a few simple goals, but I think it's enough to keep me busy for the entire year while leaving enough wiggle room for anything that may pop up throughout the year. Do-able, right? To help with my sock knitting quest I decided to pull out enough yarn from my stash to knit twelve pairs of socks (a pair a month?). It's a year of socks! 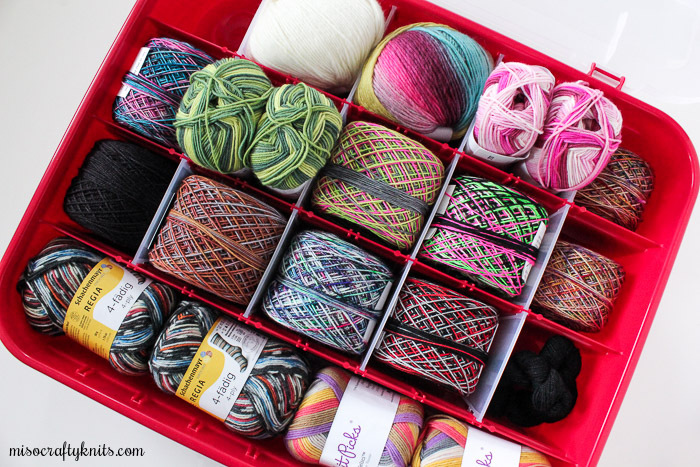 And to make it even easier for me to knit up all these socks, I've wound up all hanks and organized the yarns in the same organizer that I use for all my handknit socks (I bought two of these organizers a few years ago when they were on clearance). I'm hoping this will help me to knit with a variety of yarns from my stash from different years and not just the yarns purchased within the last few months and never properly put away. Now, I'm not expecting myself to knit all of these socks because you just don't know what the year holds, what new patterns will be released, what new yarns I may get my grabby hands on. This will merely serve as a guideline for my sock knitting. So I'm not going to be hard on myself come December if I see that only half of this box became socks. Not to mention that this box isn't including the socks that I currently have on the needles that I had started on Christmas eve. Have you set any goals for the new year? Or made any crafty plans for 2018? Please feel free to share! I'd to hear them all and we can cheer each other on! I also have a hank of WM lace that wants to be a sweater-it's variegated, so that's limiting my choices somewhat. Which patterns are you looking at? I have a few hanks of variegated too, that I have no idea what to do with! For now, I'm thinking with my tonal hank I might knit a Veronika Pullover (Julie Weisenberger) or a Granito (Joji Locatellli). I would love to knit the Hitofude Cardigan, but that open style of cardigan just doesn't work well with me. What patterns do you have in mind? 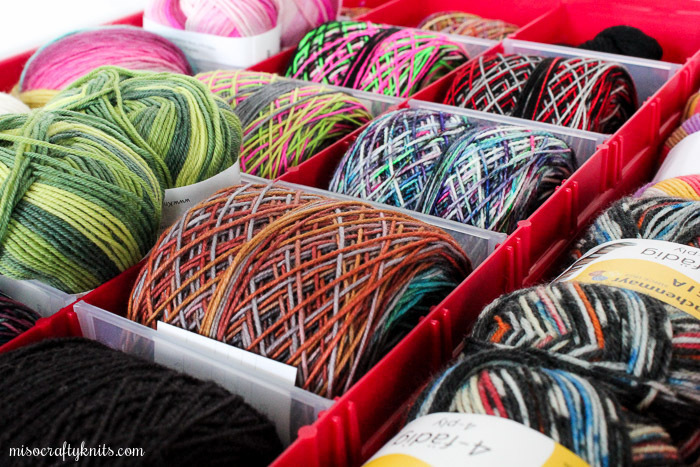 I love the sock box with yarn in it. What a good idea. I haven’t set real goals because it’s guaranteed to set me up for disappointment. I *should* knit from stash and not buy anything but those are perpetual goals that I always seem to break. Sigh. I am knitting April https://www.ravelry.com/patterns/library/april-18 using my hank of grey Wollmeise Lace. I got stuck because I couldn't understand how the keyhole was made, but I finally figured it out and it is moving along nicely!